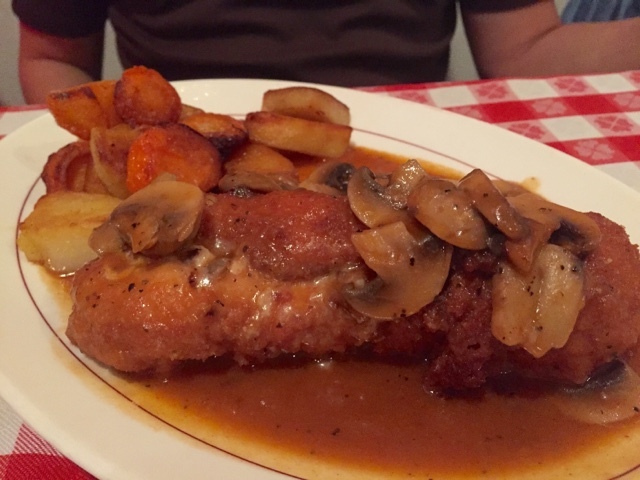 Food is my favorite: Otello - DuPont Circle, Washington, D.C. I took a mini trip with my older sister's family (S) to Washington DC and we met my younger sister (L) and her hubby (MK), in DC, as they are Philadelphia residents.When there was confusion whether someone made a reservation at Founding Farmers, we ended up being "reservation-less" on the Saturday night we arrived in the east coast. 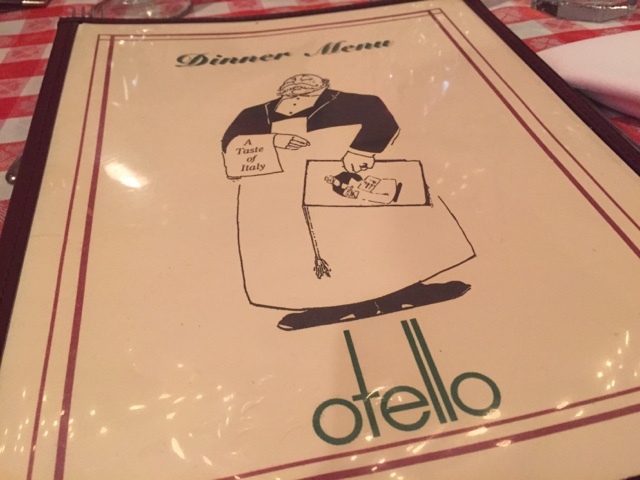 Luckily, L found Otello on Yelp. The entrance of Otello is so unassuming and if we were not paying attention, we would have passed it. Right up the stoop, we were taken to a cute, Italian restaurant in the Dupont Circle area of Washington, DC. The tables were clothed with the familiar checkered tablecloth. The restaurant had icicle lights inside, a full bar, and a larger banquet room in the back. 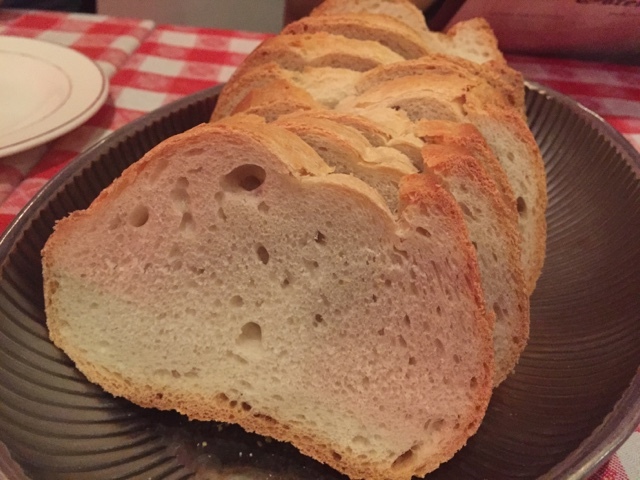 Our large group was served some fresh bread with olive oil. 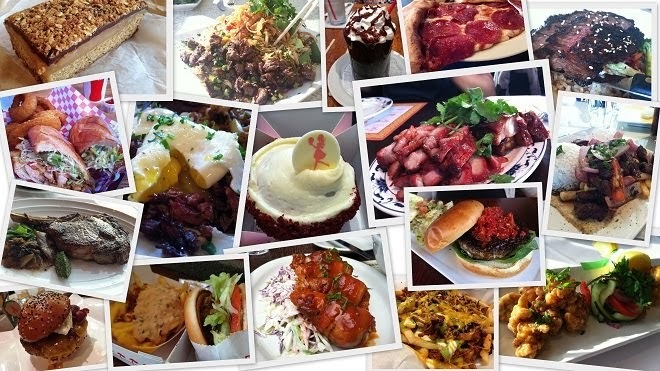 Because we had a really large group, I was only able to take pictures of food for half of the table. We all were starving, so I wanted to dig in, too! L and MK shared everything they ordered and the kitchen was nice to put them on separate plates. They both started with a simple romaine and tomato salad (not pictured), Insalata Mista ($8.50) and the Tortellini Al Basilico ($13.95). 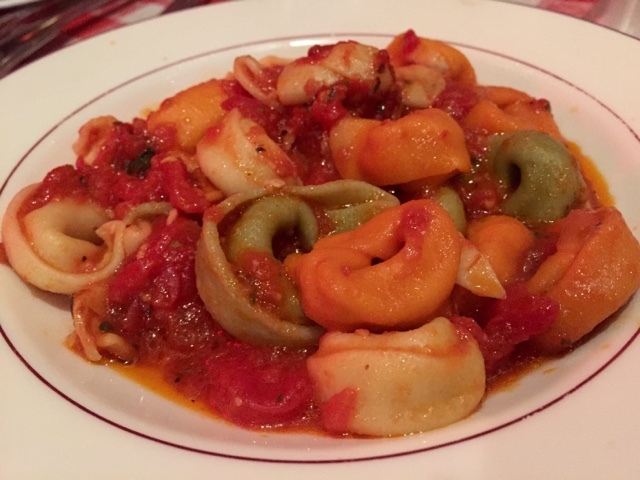 The dish was a plate of multi-colored cheese-filled tortellini in a light tomato sauce that is seasoned by basil. 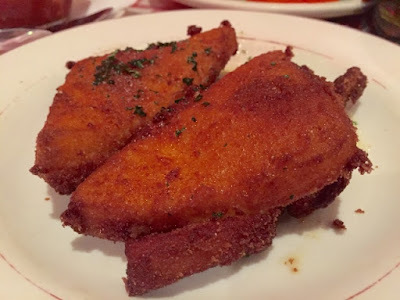 They also shared the Mozzarella In Carrozza ($9.50). Oh, man... crispy, deep fried mozzarella topped with a garlic and parsley butter. It was not your typical mozzarella sticks... this was the real deal. The cheese was warm and gooey and I loved the crunch from the breading. S's boyfriend, A, ordered the Rulata Di Pollo ($19.75), which is a roulade of chicken breast stuffed mortadella, mushrooms and mozzarella cheese. It came with a nice, rich sauce and roasted potatoes. This was my dish! I was so hungry from the lack of nutrition from flying all day (we were at the airport at 4am!) so I decided to get something pretty darn delicious and blog-worthy... because it's not your usual Chicken Parmigiana ($24.95). This was listed on the chalkboard list of menu specials and not on the regular menu. 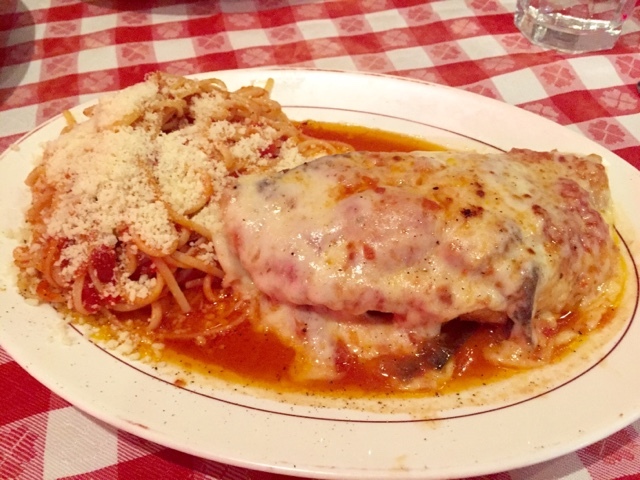 The dish also has eggplant under the hot, melty mozzarella cheese. The eggplant added another depth of flavor. The spaghetti noodles were a bit thicker than the usual spaghetti noodle, and I absolutely loved it! The tomato sauce was surprisingly light and it just went well with the chicken and the pasta. I just kept eating, eating and eating. It was so good! The other half of the table enjoyed Fettucine Alfredo ($16.50) and Capesante Alla Diavolo ($22.95), which was sea scallops in a spicy tomato cream sauce, served with angel hair pasta. All in all, we loved our experience here. The staff was so friendly and the ultimate vibe of the restaurant was wonderful. One day, we'll make it out to Founding Farmers, but we were very happy to have found Otello. 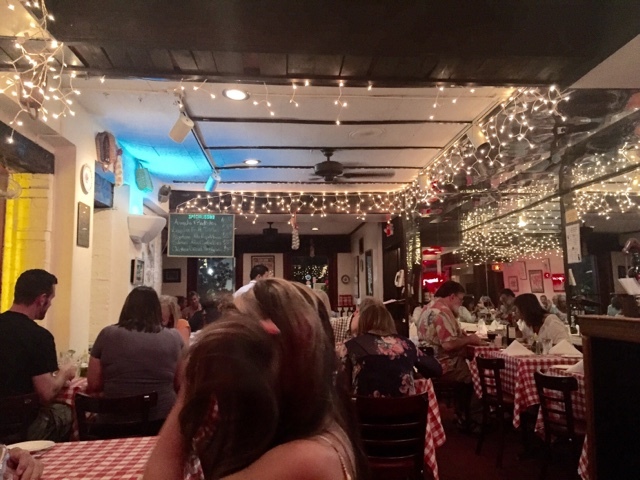 Labels: Italian, Vacation, Washington D.C.